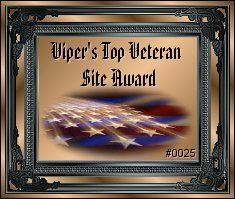 Congratulations Ned, I would like to award your website "Viper's Top Veterans Site Award." Your Casper Aviation Platoon is an outstanding website. Your pride in your work shows through your excellent website. I am honored to present your website with my highest award in recognition of the hard work you have put into your site. I could tell by my visit and review that you are proud of your Vietnam helicopter unit, because it shows in your efforts. Once again, Congrats! Ned, we are very impressed with our website that includes much history and facts about the Casper Aviation Platoon that also includes many stories and photos of our unit during the Vietnam War. Your patriotic tribute that is dedicated to all American veterans and 911 victims is also very well done. We are please to award the Excellence Patriotic Award to this excellent website.